Pandit Sethuraman in Ceylon Parliament! A Great Soul is Remembered Forever! 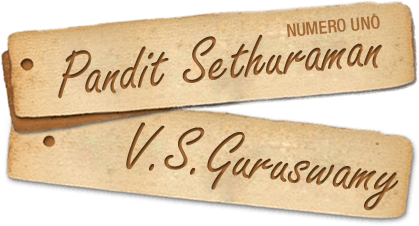 During his first visit to Ceylon in the year 1951, Pandit sethuraman was invited as a special guest to the parliament. First, he was served the world famous Ceylon Tea. Panditji did not taste the same. One member said Panditji that, this tea is the “Pride of their Country”. Please have it while it is hot. Panditji replied him saying, what looks like tea for you, looks like the blood of our ancestors who played a major role in clearing the forest and making it a cultivable area. This wonderful tea was the best outcome of bloodshed by our ancestral Tamil community. Hearing Panditji’s fiery speech, one M.P pointed that Panditji’s words could stir up the sleeping souls of the Tamil community and could even bring an ethnic revolution. Panditji said, “I foresee a very big ethnic revolution in your country after 30 years and there is only one solution to avoid the same.” The members became even more curious and asked Panditji what could be that possible solution to avoid ethnic violence after 30 years. Panditji said that having gone through the constitution of the country, he thought that if Tamil boys marry Singhalese girls in large scale, they would become Singhalese citizens and that all the problems would be solved. The M.P’s argued that a provision whereby a person marrying a Singhalese girl would get all the citizen rights was not there in the constitution. Immediately Panditji named the respective section, volume and page number of the constitution a copy of which was available with the speaker of the Parliament. The MPs referred it and were shocked to see the same. They wondered how a person from a foreign country within two weeks of his arrival had become so precise with their constitution and could find the loopholes in it. They removed that specific clause after 6 years. In 1959, when Bandaranaike was assassinated, Sir Oliver Goonetilleke, the then Governor General of Ceylon appointed Daha Naike as Prime Minister. As Panditji had said, he was the Prime Minister for the period of 12 months. When Daha Naike became Prime Minister, it was mentioned specifically in some daily papers, that except Pandit Sethuraman from India nobody ever thought that Daha Naike would become Prime Minister of Ceylon. When Panditji revisited Srilanka 27 years later, Minister Thondaman introduced him to his family members as the gentleman who had said that Daha Naike would become prime minister of Ceylon long before. Pandit Sethuraman’s wisdom is immortal in this world through his book, Science of Fortune -The Complete Book of Numerology which delivers the remarkable facts about Numerology.